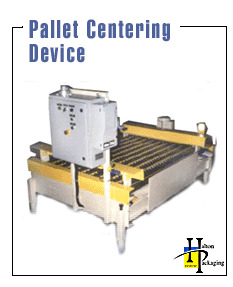 The Halton Pallet Centering Device is a 5 stationary powered roller conveyor section equipped with dual fold-up centering heads and a centering mechanism. Power is delivered to the centering heads by a centering mechanism. The centering mechanism simultaneously moves the two opposing heads toward the center of the conveyor section. The load is now ready to be used.